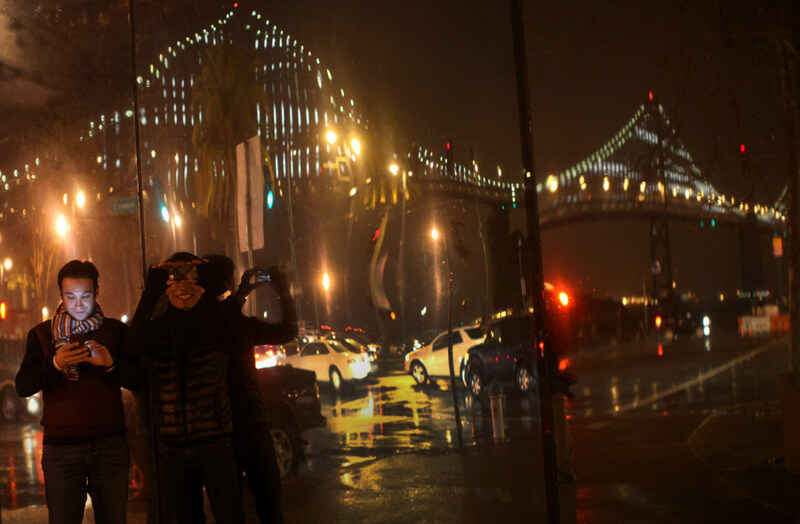 People photograph a lighted art display of the San Francisco-Oakland Bay Bridge as it is reflected in a window, in San Francisco, Calif. on Tuesday, March 5, 2013. The Bay Bridge - no. 2 to its famous neighbor, Golden Gate - was decorated with some 25,000 lights by artist Leo Villareal, making a massive illuminated sculpture. For 75 years the Golden Gate Bridge got all of the attention in the San Francisco bay area, but now – thanks to artist Leo Villareal – the Bay Bridge is resplendent, awash in 25,000 white bulbs. NBC's Gabe Gutierrez reports.